The new Olympic sport of climbing will receive £192,500 investment from the Aspiration Fund along with 14 other sports. A total of 14 Olympic and Paralympic sports including climbing, skateboarding, surfing and wheelchair rugby have received investment from the new £3 million Aspiration Fund to help support their ambitions to qualify for Tokyo 2020. Sports eligible to apply for the fund include all the unfunded summer Olympic and Paralympic sports, new sports for Tokyo 2020, and those currently in receipt of individual athlete medal support plan funding from UK Sport. Following a UK Sport Board meeting earlier this week it was decided that skateboarding, surfing and softball, which are all new additions to the Olympic programme for Tokyo, would receive investment from the fund marking the first time they have ever received UK Sport funding. Climbing and karate, the other new sports for the Tokyo 2020 Olympics, currently receive UK Sport individual athlete medal support plan funding but are both backed with additional investment from the fund. Funding will also go to the Olympic sports of badminton, archery, beach volleyball, fencing, artistic swimming and table tennis. There is a huge boost for Paralympic sports as wheelchair rugby receive £500,000 which is the maximum investment from the Fund for a team sport. In addition, the Paralympic sport of goalball will receive investment. Grants from the Aspiration Fund are capped at £500k for team sports and £275k for individual sports while they will run to the end of the Tokyo 2020 cycle. Zoe Spriggins, BMC Competitions Programme Manager, said: “We’re very excited about this announcement. It's a great opportunity to improve the chances of our GB Climbing Team athletes making it through the selection process to represent us at the Olympic Games in Tokyo 2020. Kevin Howett, ClimbScotland Sport Development Officer, said:“William Bosi shows some of the best potential for the three disciplines of Sport Climbing in the Olympics, and it has been his ambition to climb at the Tokyo 2020 Olympic Games since hearing it will be included. Liz Nicholl, CEO of UK Sport, said: “This new Aspiration Fund is a fantastic opportunity for these athletes and sports to get on track for the Tokyo Games. “Many of the sports we are currently unable to support, whilst further away from reaching the podium, have the potential not only to inspire through their performances on the field of play but also to inspire new audiences to engage in sport and activity. 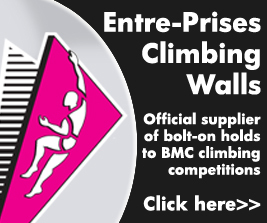 Plans to move the Paraclimbing World Championships 2019 from Tokyo have just been confirmed by the International Federation of Sport Climbing (IFSC) after it was notified that the arena holding the event is available for one day less than originally planned. However, before the official response was released the news broke on Facebook and a petition to keep the event in Tokyo began to gain momentum on the internet.